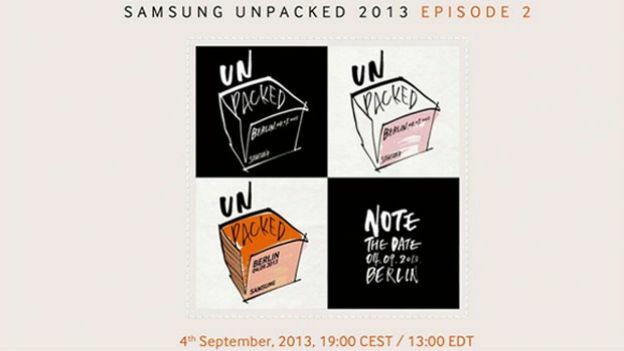 Galaxy Note 3 to be revealed September 4th? Samsung has revealed it will be hosting another Unpacked event in Berlin next month, and dropped a pretty big hint in the process. The Korean firm has reminded us to "note" down the date - September 4th - in what could be a thinly veiled reference to the upcoming Galaxy Note 3. We've got good reason to expect the new handset will finally be getting the limelight as Samsung used last year's IFA event to unveil the Galaxy Note 2 as well as the Samsung Galaxy Camera. Rumours of the Galaxy Note 3 have been floating around the web for some time now and the general consensus suggests a 6.3-inch screen with a Full HD resolution. Other possible specifications include an 8-core in-house Exynos processor, 3GB of RAM and a 13MP rear-facing camera. If these guesses prove accurate, the result would be a handset with power eclipsing Samsung's own Galaxy S4 flagship. Some are even speculating that we might see the Samsung smartwatch revealed alongside the Galaxy Note 3. The IFA conference runs every year in Berlin and is one Europe's biggest tech shows. Stay tuned to T3.com for the latest news and announcements from the show.